We contributed a Design/Build commercial rainwater harvesting article published in LANDSCAPE CONTRACTOR magazine, a National flagship publication. Anthony Paredes wrote about the benefits of the rainwater harvesting and permeable paver patios. We have produced numerous other publications and articles about eco-friendly landscaping. Anthony served as a Judge for the 2010 ALCA Excellence in Arizona Landscaping Awards program. We enjoyed the best-of-the-best Design/Build landscapes in Arizona. In December 2009 Stephanie Crawford and Anthony again enjoyed contributing to the achievements of young people by serving as Judges in the annual High School Floriculture competition at ASU Polytechnic Campus. On November 17th, 2007 the Arizona Landscape Contractors' Association (ALCA) held their 31st "Annual Arizona Excellence In Landscaping Awards Banquet" at the Buttes Marriott Resort in Tempe, Arizona. Among the winners were local landscape contractor, Desert View Landscape, who received the "Budding Contractor of the Year" Award. This award is granted to the the member contractor who has started a business in the past 5 years and has demonstrated outstanding service to the association and the industry. Desert View Landscape was also featured in the Phoenix Home & Garden Magazine March of 2008. Our company believes in volunteering its time and resources working with young people and the community. Recent volunteer work includes: 1. The Arizona Humane Society, Phoenix Arizona- planting 78 trees in conjunction with the Arizona Landscape Contractors' Association. 2. Arizona High School Floriculture Career Development Event, ASU Polytechnic campus, Mesa, Arizona in conjunction with Mesa Community College. 3. Neighborhood Outreach revitalization, Mesa, Arizona- helping to revitalize an community neighborhood. 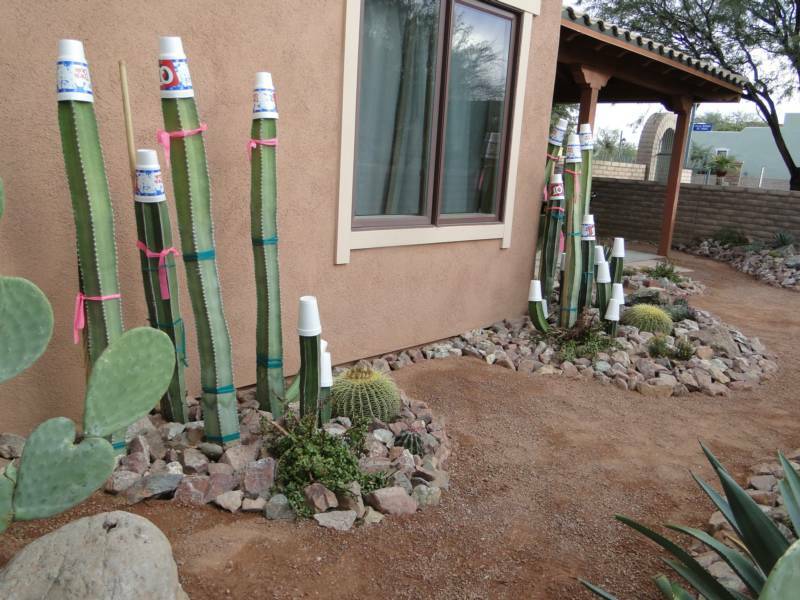 Smart Irrigation controllers, sponsored by Salt River Project. Tony is a formally educated landscape and irrigation contractor who also is an environmental landscape designer. He graduated with a Bachelor of Science Degree from Arizona State University. His education also includes a 2 year Business Degree from Scottsdale Community College and Landscape Design, Drafting and Horticulture training from Mesa Community College. With 11 years in the landscape industry, Tony receives great satisfaction watching people see the potential that their outdoor spaces have. His passion for plants and creating outdoor environments continues to grow with the seasons. Creating usable outdoor spaces adds great value to peoples quality of life and lifestyle. "I LOVE IT". Key to the company's success is continued and on-going education. "It is our identity and makes our employees excellent landscapers ." Smartscape Certification, sponsored by the Arizona Municipal Water Association, University of Arizona Cooperative Extension, Arizona Nursery Association, Arizona Landscape Contractors' Association and Salt River Project. Arizona Certified Landscape Professionals Program, sponsored by the Arizona Landscape Contractors' Association. Low-voltage Landscape Lighting Design, LED lighting design, Focus Industries. Interlocking Concrete Paver Institute Certification. To recharge the batteries and keep the creative juices flowing, industry training is scheduled once or twice per year. We also develop young people and students who are new to the industry. Stephanie has an infectious passion for landscape design and plants. Her formal Horticulture, Landscape Design, and Drafting education is from the Urban Horticulture program at Mesa Community College, Mesa Arizona. She has completed the Arizona Certified Landscape Professionals Program, sponsored by ALCA. She specializes in creating custom planting schemes, using a variety of plant color and plant textures in her designs, plant selection and plant placement for best plant performance and Summer, Fall, Winter and Spring seasonal color combinations. Stephanie loves to share her knowledge of plants and landscape design.